In such “an extreme season,” one that has seen north west Victoria receive its annual rainfall in the space of a month, the Walters family of Manangatang, says the operating efficiencies of its new 1386 Cropland Equipment Rogator self propelled sprayer have proved their worth. “With a bit of share farming we put in about 12,500 acres of cereal and canola,” Trevor Walters said. With some 1700 hours on the 1274C, and with “excellent service and warranty” attributes, the Walters say they found Croplands Equipment to be “a good company to deal with,” quickly making their replacement decision. It looks to have been an opportune time to change over, also a good time to increase efficiency by 20 percent, aided by a wider boom. Today, the property operates with a 120ft boom, plus enjoys a tank capacity that has been lifted from about 5000L to a fraction over 6000L, giving the Walters a further lift in operational capacity. “It all adds up to getting more done with less fills. Our spraying window is reasonably small and we like to keep the Delta-T levels right for ideal spraying,” Walters said. 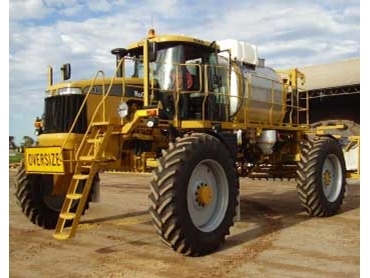 The family expects Rogator self propelled sprayers like its new 1386 model sprayers to cover between 500 to 600 hours a year, thereby quickly earning its keep.